The Trail Series gives members who prefer dirt beneath their feet the opportunity for a little friendly competition against each other. The series includes distances from 5k to 50 miles. For 2019, please see the Trail Challenge. This will replace the Trail Series. It is not necessary to qualify for the Grand Prix to compete in the Trail Series. 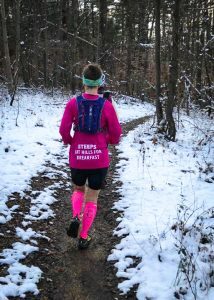 For each race in the Trail Series: Lou will do some magic to adjust the race finishing times using the Strava Grade Adjusted Pace, to allow a more fair comparison between flatter courses and courses with more climbing and technical trail. These times will then be converted to an age-performance percentage (see below). That percentage will be converted to a 4-digit number, which becomes your score for the race. Top 3 scores per runner will be totaled, resulting in a final score for the series. Age-graded scoring allows runners of any age and any gender to be compared fairly against each other. If you are interested in the fine details, click here. The official age-grading calculator used by FSRC for the Trail Series can be found here. Awards for the top 3 female and male winners are distributed at the FSRC Year-End Celebration Banquet.